The power of getting back to nature is quite underestimated and anyone of any age can enjoy the wonders of this sanctuary. Waterfalls, lookouts, dense bush and open plains can all be experienced from a number of different ways including walking, picnics, mountain bike riding, horse riding, four wheel driving or even hang gliding. Dynamic Flight Hang Gliding School has been operating full time since 1991 in the Beaufort area and is one of the few hang gliding schools in Australia that operates year round. Their location provides access to a large variety of launch sites which cater for every wind direction. With such an interesting variety of things to do, visitors are surprised by what can be experienced in both a long or short stay in the area. Come and see for yourself what the Pyrenees has to offer. Walk through cool fern gullies and alpine plateaus then rest to take in the views across the spreading plains to Langi Ghiran and the Grampians. Experience a night at the charming Beeripmo campground, then descend through spectacular tall forests. Located one hours drive west of Ballarat, just off the Western Highway, Mt Cole State Forest is 25 kilometres from the township of Beaufort. The mountain was created 390 million years ago when hot magma pushing up from deep beneath the earth, but failing to break through, crystallised to form granite rock. Daily for millions of years nature continued to sculpt the area eroding the softer sediment, leaving the hard rock protruding from the plains below. Large native trees including Messmate, Manna Gum, and Blue Gums can be seen on the wetter southern half, while woodland species such as Yellow box and Red Stringybark grow to the north. Plants such as the rare Mt Cole Grevillea can be found in a few locations, as can native orchids and a plethora of wild flowers. Bird watching can be very rewarding with more than 130 species of birds sighted in the forest. Kangaroos, wallabies, echidna, koalas and possums are also often seen. Distance 21 km 11 hours 2 day return (moderate) Starting at Richards campground, the most recent walk at Mt Cole is a journey of discovery for the novice and experienced hiker. 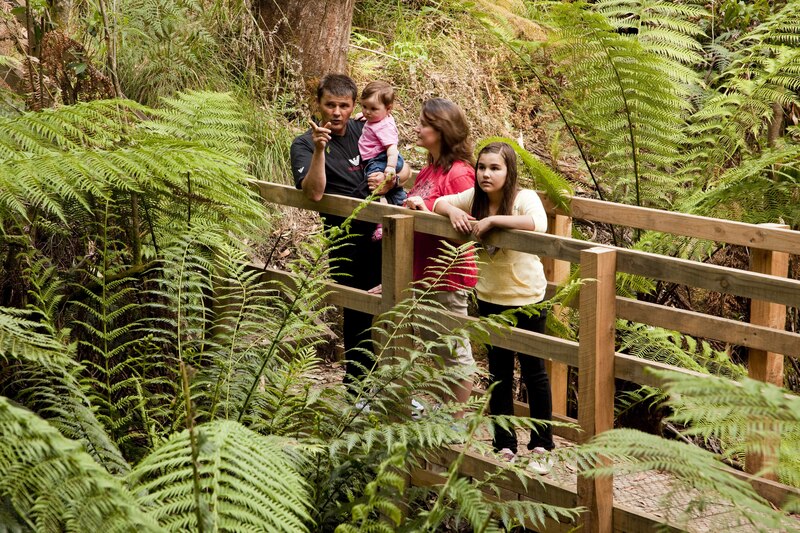 Walkers can experience a variety of different forest environments from lush forests with ferns, falls with a gentle sound of running water, the brilliant green of the moss covered rocks, weather beaten rocky outcrops and magnificent vistas of the tablelands below and surrounding mountain ranges. This walk from Chinamans to Ben Nevis is a bird watchers delight. It was named in memory of noted local bird observer Max Borella and offers great lookouts. As the walk can be quite steep in places, it is recommended that you take your time and enjoy the views. Choose appropriate footwear for the terrain. Solid but lightweight walking boots are best. Avoid sensitive vegetation by staying on the walking tracks. Stay on tracks even if they are rough or muddy. Walking on the track edges and cutting corners on steep `zigzag’ tracks will increase the risk of damage to the environment and the risk to personal safety. topographies mean there is something for everyone. Remember that seasonal road closures apply in a number of areas from mid June to early November. Riders are welcome to use most areas of the State Forest, the majority of riding opportunities are along existing State Forest roads. Smith’s Bridge picnic area provides the best base for horse riding in the Mt Cole area. Horse riding on walking tracks is not permitted.